One of the most important keys to a healthy lawn is the soil, and organic matter is especially important for good soil. It’s not just dirt…soil is a living, dynamic ecosystem. Healthy soil is filled with organisms that perform many vital functions including converting dead and decaying matter as well as minerals to plant nutrients. Different soil organisms feed on different organic substrates. Their biological activity depends on the organic matter supply. 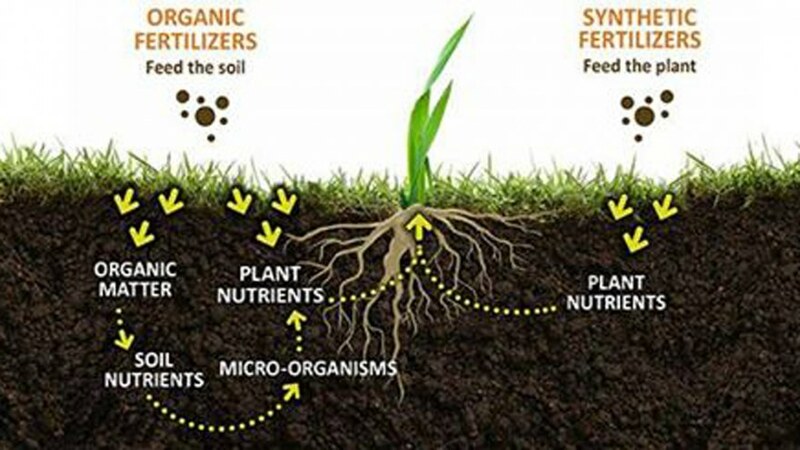 Building the soils nutrients is a long-term process but can be beneficial. A soil test is recommended to check for these levels and other nutrient levels in your soil. So what exactly is organic matter (OM)? You may think of leaves, animal manure, kitchen waste, wood chips or broken plant parts as organic matter. This stuff is actually organic material, not organic matter. So what’s the difference? Organic material is anything that was alive and is now in or on the soil. Organic matter is what all those things become when they are broken down and begin to release their nutrients. Once the organic material breaks down until it can’t anymore, it becomes hummus. Hummus can hold 80-90% of its weight in its water, which means it’s amazing at protecting your lawn from drought. In addition, hummus can help balance excessive pH levels and prevent disease and preserve overall soil structure. The only way to build up a hummus layer in the soil is to add organic matter every year. Most soils contain 2 to 10 percent of OM but we rarely see these percentages over 5% in Omaha. However, even in small amounts it is very important. It is responsible for storing a large amount of the nutrients (such as nitrogen, sulfur, phosphorus) in soil. In addition to being good for your plants, this also encourages the microorganisms that are responsible for making more healthy organic matter for your soil. Organic matter is especially helpful in preventing drought conditions on your lawn. It can act as a sort of sponge that holds and provides moisture for your lawn. Increasing organic matter by as little as 1 percent can increase drought tolerance by 50%! It also helps stabilize soil to prevent erosion, and keeps soil from being too sticky. This allows the soil to be better permeated by water to water root systems and avoid crusting on the top. A healthy level is especially important in the spring and summer, when your plants grow the most. Luckily, organic matter breaks down more quickly the warmer it gets. Omaha Organics has products to help you get the organic matter that you need, all of which are safe for pets, children, and your environment. They also are free of animal manure and by-products. Your options include bulk or granular compost. Our “less-mess” granular compost product is available in 44 lb. bags. The bulk compost is a mixture of lawn clippings, leaves and wood chips that are recycled for two years so that they can become as rich in nutrients as possible. Both options are good for either potted plants or lawn topdressing. If you’re looking for a way to improve your soil’s overall healthiness and function, organic matter is a simple natural solution. class="post-template-default single single-post postid-966 single-format-standard samba_theme samba_left_nav samba_left_align samba_responsive wpb-js-composer js-comp-ver-5.0 vc_responsive"